1. Meteoric Rise to Fame. 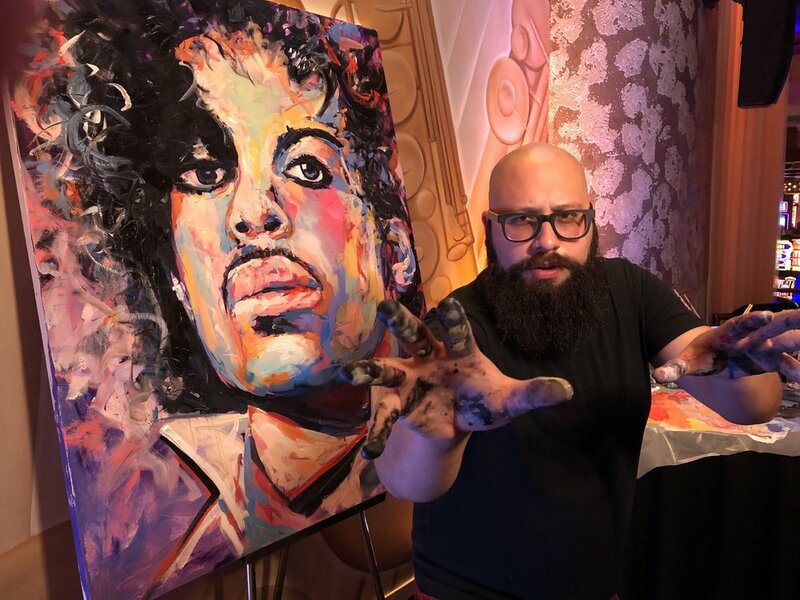 In the last three years, Joe has become a nationally-known celebrity artist. 2. Steadily Increasing Price-Points: Joe’s market is rapidly growing and his price-points will also grow to meet demand. 3. Eclectic styles and subjects: Joe is all things to all collectors. Whether you like realism, abstract, pop art, contemporary and anything in between, Joe caters his style to any and all collectors. With a few lines I can say so much. That’s where art comes to life for me. "Bob Ross Meets Frank Sinatra"
Joe Everson is a renaissance man — artist, vocalist, musician, and photographer. His viral videos of singing the National Anthem while painting a live-action artwork have over 175 million total views. Joe travels the nation as a favorite of professional sports teams and Fortune 500 companies. He has been featured on FOX News, ESPN Sports Center, Fox Sports, SB Nation, NHL.com, Washington Times, CBS sports, USA Today, Huffington Post and has had nationwide coverage from media and celebrities. Joe Everson has performed for the Golden State Warriors, Milwaukee Bucks, Florida Panthers, San Antonio Spurs, Toledo Walleye, Reading Royals, Hershey Bears, Greenville Swamp Rabbits, University of Arkansas, University of Mississippi, University of Alabama, the Arnold Schwarzenegger Classic, PragerU, MINT Museum Charlotte, JJ Watt Foundation, USO San Diego, Winter Equestrian Festival and International Polo Club.